As June turns to July, Prague will host the fifth annual independent and amateur theatrical show, V. MB(apostrof)99, Praha 2003. In recent years, nearly 60 plays were presented by theatrical ensembles from the all over the world. The organizers would like to top off the “five-year plan” with a program that recapitulates the finest festival presentations to date. At the same time they want to present new, lesser-known theatrical cultures. Suzanne Vega’s visit to the Czech Republic this year will be another opportunity to enjoy one of the strongest singer-songwriters of the last decade. She began playing the guitar at age eleven, and her self-titled first album was released in 1985 to critical acclaim. 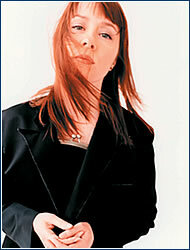 Her follow-up album – Solitude Standing – included the megahit “Luka” and received three Grammy Award nominations. But she didn’t get the award until 1990, for her Days of Open Hand album. In subsequent years, she released the albums 99.9 Degrees Farenheit and Object of Desire. Her most recent album, Songs in Red and Gray, came out in 2001, and is considered by many fans and critics to be one of her finest recordings to date. For the fifteenth year, the city will be enlivened by its favorite dance festival – Tanec Praha. Already a tradition, as well as an integral part of the city’s life, it has also become an event on the calendars of Brno and Hradec Králové. After a strenuous search, this event has found its own stage, the Ponec theater, while some shows will also be performed at Slovanský dům and the Stavovské Theater. Fans of dance can expect to see artists and ensembles such as Ballet du Grand Théatre de Gen`eve, Il Circo Contemporaneo, Laroque Dance Company, Charles Linehan, Anouk van Dijk, and Skalen. The Czech Republic will be represented by the Prague Chamber Ballet, Tereza Ondrová and Veronika Knytlová, among others. Tanec Praha 2003 – XV. Mezinárodní festival soudobé taneční tvorby a pohybového divadla, Slovanský dům, Stavovské divadlo, Divadlo Ponec, June 9-27 at 17:00, 19:00, 20:00, tickets 120-200 Kč. Obecní galerie Beseda will be the scene of an exhibition of photographs for sale by the classic Czech photographer Ladislav Sitenský (1919). He is known for his extensive reproduction in magazines, and his photographs have also appeared in many publications about war, Prague, sports, mountains, travel, and other themes. A quarter of his collection consists of travel photographs (France, Italy, Malta, Norway, Greece, Egypt, Cuba, Tunisia, Algeria, Morocco, North America, etc.). 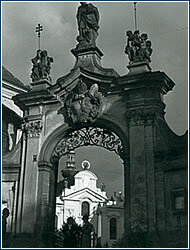 The uniqueness of Sitenský, who began taking pictures at age 14, lies in the diversity of the topics and motifs he has captured in his lens. Although he claims his intent at the time he took the pictures was purely artistic, today his works have considerable documentary value. The exhibition will display a selection of 129 black-and-white photographs from the Mountains, War, Prague, and Nature files.